Boy, doesn’t this group sound like a hoot to be around? Between the manipulation and judging, there are the toxic folk who love to spew their vile words about seemingly anyone. Predictably, many of these words are intended to hurt someone else – possibly even you. Toxic people are notorious for projecting their insecurities and low self-esteem onto others. If you know of a toxic person, it is critical for you to understand that nothing that they say should be taken personally. 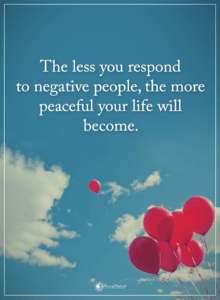 In reality, toxic people are miserable, and – for some elusive reason – use others in a vain attempt to make themselves feel better. While a toxic individual can (and sometimes does) contaminate the environment without words, they do have a few phrases that are common among them. Here the toxic person is coaxing someone into believing that they’re the ones at fault for the current predicament. The damage to self-esteem isn’t necessarily in being labeled a drama queen (although it could be perceived as such) but the behind-the-scenes manipulation that’s taking place. The chances are that the toxic one has done something to hurt the other intentionally – and with seemingly little regret. Such statements may send a person reeling, especially someone who is in a delicate state. Nobody likes to be told that what they have to say is invalid. Phrases like “You don’t know what you’re talking about” gives off a vibe of intellectual superiority that most of us find reprehensible. These words can be hurtful and embarrassing. More than likely, the toxic person saying these words is trying to slither their way out of some kind of trouble. And as this example shows, they’re shameless in how they go about doing so. Well, it’s probably not your fault at all – whatever it is. But just for the sake of playing devil’s advocate, let’s just say – on this occasion – that ‘it’ happens to be “your fault.” What does this mean? Put simply: In the view of someone toxic, any kind of “affront” is fair game to use as ammunition. Maybe you did the thing at the time at the place – and now they use your (often innocent) mistake as a means of justifying their (often far worse) behavior. In the end, this manipulation rings hollow – but not before someone usually gets hurt. (The blame game, continued.) An honorable person doesn’t feed off of someone’s fear and anxiety. But, then again, a toxic person isn’t exactly honorable. Besides demonstrating a clear breach of respect, there is plenty of irony to be found in these four words. They’ll never admit it, but they are the insecure ones. In short: they’re projecting, and they may not know any other means of expressing their perceived inadequacies. This doesn’t excuse the outright disregard for someone else’s self-esteem, however. These words are meant to be used as a threat or an ultimatum. Either way, a real friend or partner doesn’t say such nonsense. Most certainly, a real friend or partner doesn’t utter these words with no genuine sincerity. Nonetheless, that is exactly what is happening; the toxic person doesn’t care about your behavior; they care about getting something out of you. Once again, they are projecting their own shortcomings onto you. It goes without saying that no one should subject themselves to this type of treatment. 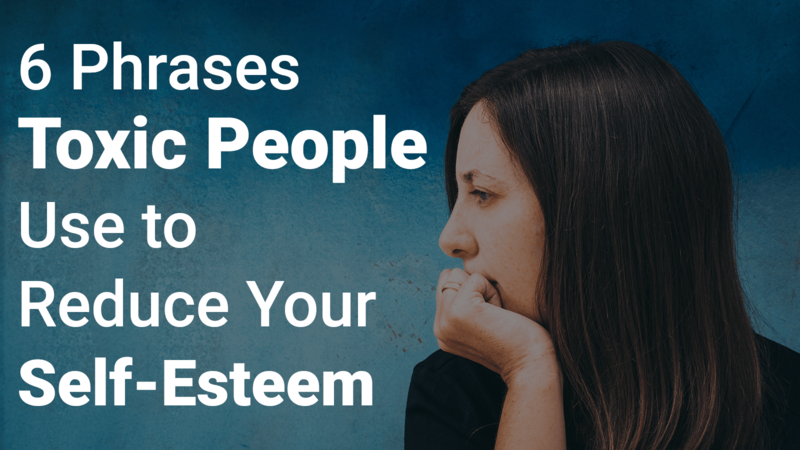 It comes as no surprise that toxic people tend to have a narcissistic streak. When passive-aggressiveness (or other manipulative techniques) fail, they will sometimes turn to old-fashioned verbal abuse. Usually, this occurs out of a sense of desperation, and the ugliness that is their natural disposition fully reveals itself. “You are stupid,” “You are worthless,” and “You are a loser” are three choice phrases of toxic people. If you should ever find yourself on the receiving end of these hurtful words, you can take solace in knowing that it has nothing to do with you. As mentioned earlier, the toxic person is using you as a sounding board for what’s going on inside their head. Ignore them. Walk away. Repeat. Do these three things enough, and you’ll almost certainly be rid of them.